Now that Tristan and Isolde have united in death on Seattle Opera’s stage for the seventh and final time, we wanted to look back at the provocative diversity of reactions to the production that we’ve enjoyed reading in traditional media reviews, in the blogosphere, and on Facebook. 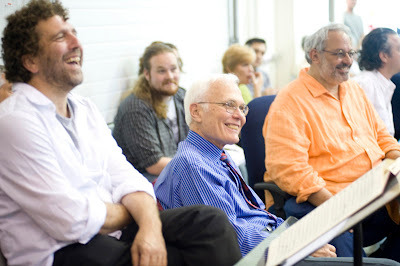 Asher Fisch’s conducting and the strength of the cast were universally praised, but other elements of the production invited—and received—a wider variety of responses. 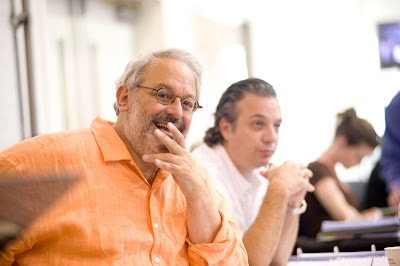 Stage Director Peter Kazaras at a Tristan rehearsal. If art is supposed to provoke the audience and inspire a myriad of reactions, Seattle Opera has done its job with this Tristan und Isolde. Even one of the self-admitted “booers” on opening night (the only performance to provoke this particular response!) wrote in to Oregon Music News to say he wanted to encourage people to buy tickets—and that he was hoping to return on closing night. Conductor Asher Fisch, General Director Speight Jenkins, and Stage Director Peter Kazaras at a Tristan rehearsal.